Do you know what to do in an emergency situation, whether at home or when out and about? Or do you need to refresh your first aid skills? 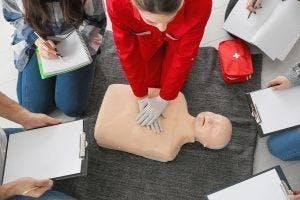 This course will give you the skills and knowledge required to provide a first aid response, life support and management of casualty in a range of situations, such as the home, community and workplace, until the arrival of medical assistance. Please note you are required to complete the supplied work booklet prior to attending the session. This work booklet is marked and corrected on the day and goes towards your pass mark. Failure to complete the work booklet and attend the mandatory full day session will mean you will not qualify for a certificate. Once you have registered, further information will be forwarded to you on how to access you Unique Student Identification (USI). You require this to receive a certificate of qualification valid for three years. Full cost of this session is payable before attendance through ticket selection. Payment options include debit and credit cards. Should a carer be unable to afford this, please contact Carers ACT via rsvp@carersact.org.au or by calling 6296 9982. As this session is at a cost to Carers ACT if a Carer is unable to attend on the day there will be no refunds.